How else do you record a Bugatti Chiron driving at 249 mph? If you haven’t already seen the video of the Bugatti Chiron breaking a new speed record, go watch it right now. Astonishingly, the hypercar managed to accelerate from 0-249 mph and back to 0 again in just 42 seconds. The eagle-eyed among you will have noticed that there are quite a few tracking shots of the Chiron reaching breakneck speeds in the video. Some have even suggested that Bugatti faked the record. After all, how on earth do you film a record-breaking Chiron driving at 249 mph? The answer, it turns out, is very simple: use another Bugatti Chiron of course. Bugatti has confirmed that a white Chiron camera car was used to record the hypercar's speed record. It sounds crazy, but then there aren’t many production cars in the world that can keep up with the Chiron. What still isn’t clear, however, is what camera rig was attached to the Chiron to capture stable footage, because your average setup isn’t going to survive the extreme speeds the Chiron is capable of. 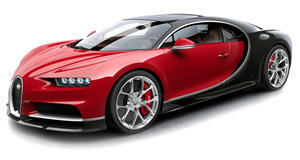 Bugatti used a special system, but didn’t go into detail. We can only assume it must have been very advanced. While the Chiron’s speed record was undeniably impressive, what we’re really waiting to find out is its true top speed. Currently, the Chiron is limited to 261 mph, but Bugatti will be lifting the limiter and attempting a new outright speed record next year. Hinting at its potential performance, the end of the record video shows the speedometer reaching 273 mph. Watch this space.